Are you ready for some purple and a little spring? I know that I am ready for spring; me and this cold wet weather do not get along at all. My project is dripping in purple and will make you want the warmer weather. 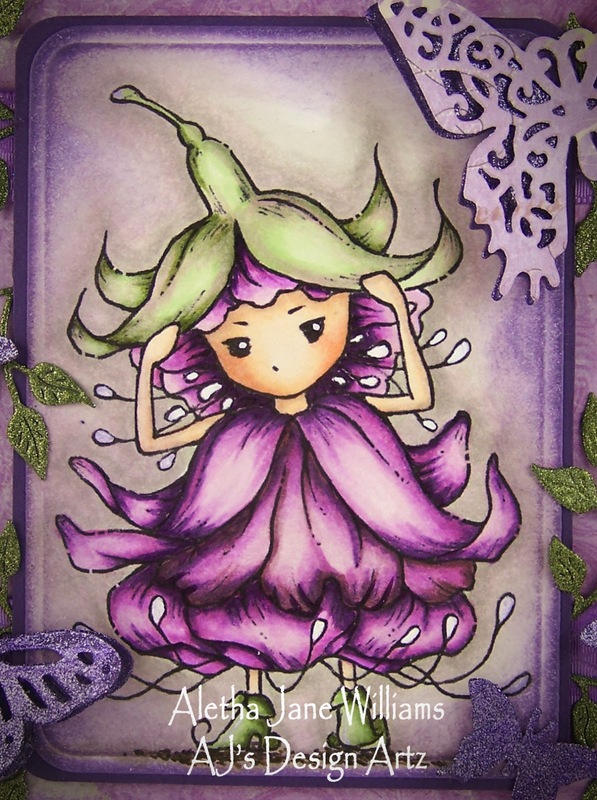 I would like to introduce you to “The Fuchsia Sprite” by Mitzi Sato-Wiuff. 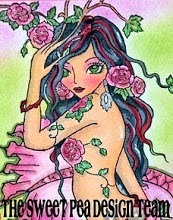 She is a new artist that was introduced to us all by SweetPea Stamps. Mitzi’s images will all be rubber stamps. I love all things fantasy! Mitzi’s images are right up my alley and so much fun to color with Copics. After the coloring I die cut the image with Spellbinder’s Card Creator A2 Curved Basics die. After the cutting and embossing I distressed the edges with Dusty Concord Distress Ink. 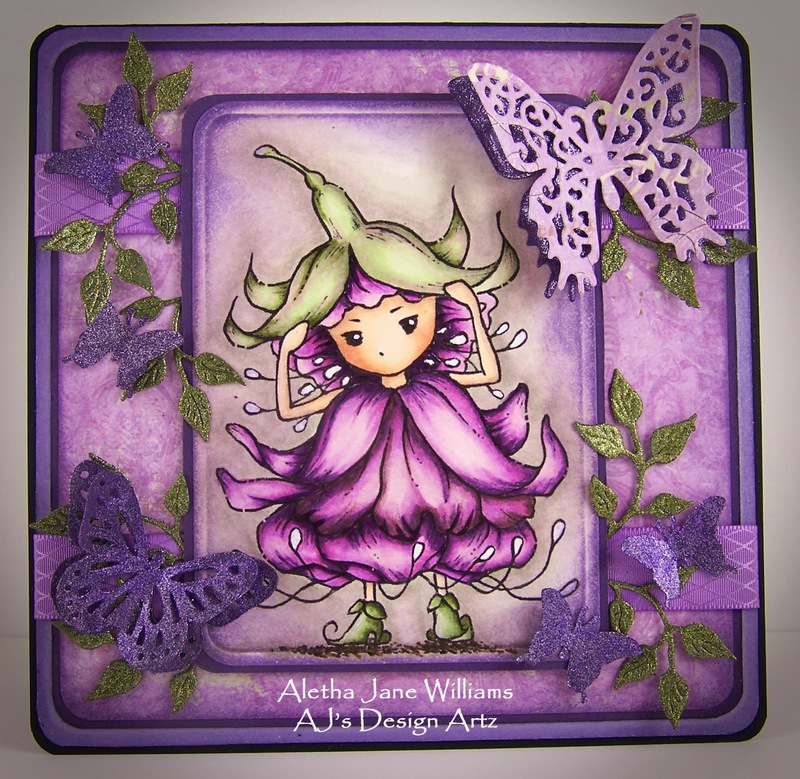 This little sprite was then layered on Stampin’ Up!’s Elegant Eggplant cardstock. The designer paper is Prima’s Sweet Fairy collection. And the light purple Stardream cardstock is from PaperWorks. My embellishments were a lot of fun to make, but most of Mitzi’s images really need to stand on their own. I kept my embellishments on the light side. The large butterfly is Spellbinder’s Les Papillions. I also have one on the inside. These butterflies are in two parts. The top die I cut with the designer paper, and the bottom die I cut with SU’s Elegant Eggplant cardstock. I then added Viva Décor’s 3-D Violet stamp paint to the bottom layer. The other butterflies are Martha Stewart’s punches and I added the 3-D violet stamp paint to them also. The little vines are from Cheery Lynn’s Ivy Strip. I cut them with SU’s Always Artichoke and added 3-D stamp paint in Moss green for that little bit of sparkle. My ribbon is my ever growing stash from Really Reasonable Ribbon. Just a few things going on at Sweet Pea Stamps. There is an amazing sale that is lasting until Dec. 31. Click here for the sale, you won’t want to miss it. We have our December challenge up and running at One Sweet Challenge. Our theme is “A Gift in Itself.” We would love for you all to come share your little pieces of art using Sweet Pea Stamps in rubber or digital. Come join our SPSFacebook group. So glad you made it by today. If you have any questions, please contact me. 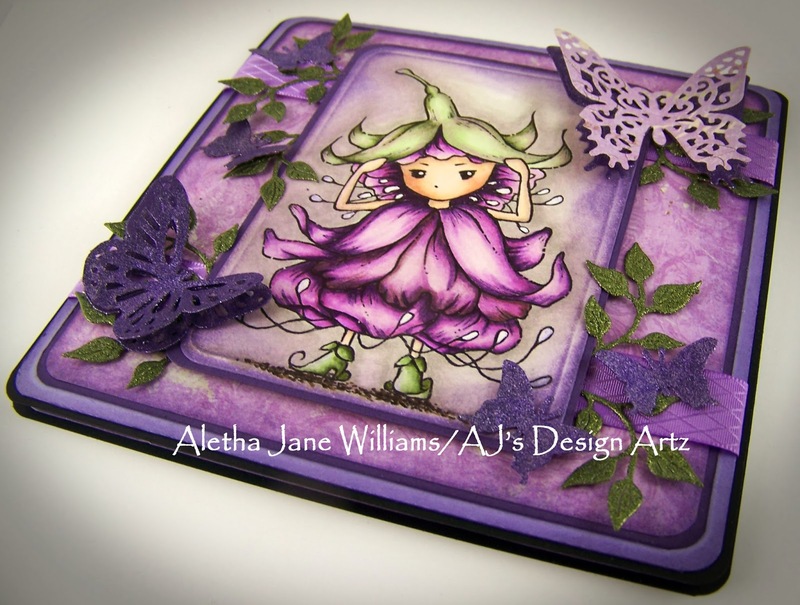 Aletha, your card is GORGEOUS! I'm also looking forward to warmer weather already. XD I love the color scheme of purple and green here. And all the details you put together make for a really beautiful project. *love* Thank you for using my Fuchsia Sprite. Love your coloring! What a fun card!